Triple-digit temperatures are not unusual in McAllen, Texas, but even the recent 100-plus degree heat could not melt the enthusiasm of 2011 graduate Victor Flores as he progressed through one of his best summers ever. Flores, 33, who capped his academic career at WMU-Cooley Law School by being chosen by his fellow graduates to give the Wilkins Class valedictory speech, has been having a spectacular couple of months. In June, Flores was named to the State Bar of Texas Leadership Academy. He is one of only 20 young attorneys chosen from throughout the state to participate in the prestigious year-long program. The group will meet three times throughout the year, with members traveling to Austin, Dallas, and South Padre Island, Texas, to learn about and discover their leadership philosophy, and to network with State Bar officials and with fellow up-and-coming attorneys from across the state. In addition, participants will each take on a project that they will present at the State Bar’s annual meeting. 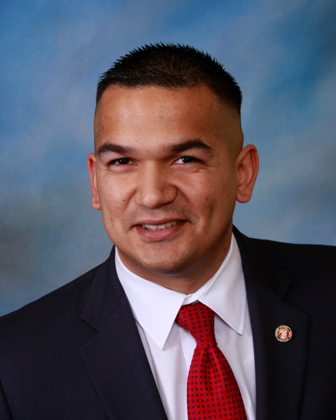 “You’re connected with a high level of state bar officials and you learn how to become a leader,” Flores explained. Flores is excited about the academy. “I think it’s a really good opportunity, both for me and for McAllen,” he said, explaining that it can be challenging to network when the centers of Bar activity are often hours away in Houston, Austin, and Dallas. Just as Flores will learn from the academy and bar officials during the meetings, so he plans to share the exciting programs of McAllen with his fellow attendees. “We’re one of the few cities that do everything,” explained Flores, who has been an Assistant City Attorney with McAllen since November 2013. He is one of four assistant city attorneys, who are part of a collegial and supportive team that includes the city attorney, deputy city attorney, and two prosecutors. One of the absolute coolest things about the job, Flores said, is the variety of law he gets to practice every day. Election law, constitutional issues, real estate matters, contracts, and planning/zoning issues, are just some of the matters that cross his desk every day. “It’s academically rewarding,” he explained. Flores and his office also helped in a situation that had McAllen in the national news a year or so ago when an influx of young Central American immigrants meant all-hands-on-deck as they sorted out the legalities and logistics involved with getting the children to their U.S. families while awaiting their court hearings on immigration status. In other professional accomplishments of Summer 2015, Flores was appointed as a council member for the State Bar of Texas Government Law Section, named as a director for the Hidalgo County Bar Association, and chosen as a Vice Director for the American Bar Association Young Lawyers Division Disaster Legal Services Program. He also continues to serve as Associate General Counsel for Baptist Temple McAllen Church. Whew! And if that wasn’t enough, Flores and his wife, Kristal, are expecting their first child and plan to have a Gender Reveal Party during Labor Day Weekend. Flores is actively involved in each of the Bar activity groups. With the Government Law Section, Flores said they’re meeting quarterly, but involved throughout the year, providing Continuing Legal Education updates, becoming an active presence on social media, and sending out E-blasts on issues of importance to the section. With the Disaster Legal Services Program, Flores oversees six districts, working with them to update their disaster plans, including how to provide legal assistance in the wake of a disaster. Flores is an outstanding ambassador for the joys of a legal career where helping people is a primary focus. While he always had an interest in the law, he started solidifying his plans for law school during a tour of duty in Iraq. A staff sergeant with the U.S. Marine Corps 2001-2008, Flores served some of his time in Texas, but also did a tour in South America, in addition to his time in Iraq. Flores determined then and there that he would make sure their sacrifices meant something. When he returned to the U.S., he finished his undergraduate work at the University of Texas Pan-American (now the University of Texas Rio Grande Valley), then applied to law school. He chose WMU-Cooley because he could start right away, and in January 2009, Victor and Kristal Flores left south Texas and were introduced to winter in Michigan. As surprising as it might seem, they didn’t mind the weather. As much as Michigan residents don’t like their winters, Texans are not particularly fond of their state’s summers. “We miss Michigan,” Flores said. “We miss the fall and the temperate summers,” he said, plus such attractions as Uncle John’s Cider Mill and Frankenmuth. Flores keeps in touch with many of his fellow graduates, along with staff members and professors with whom he forged relationships during his time in school. The practical education and the hands-on training through his externship, led him to where he is today. It was attorney Dave Louie (a Houston attorney who he met through his WMU-Cooley externship), among others, including Texas attorneys Joe Escobedo and Ernest Aliseda, who nominated him for the Leadership Academy. He is looking forward to the exciting changes in both his personal and professional life. In October, he will be part of the city of McAllen’s new in-house litigation defense team, and in March 2016, he will become a first-time dad. With his recent appointments and an ever-more rewarding career, the long hot summer has been totally worth it!